This option is for families that don't wish to have their pet's ashes returned nor wish to bury at home. Pets are respectfully cremated with other pets at a licensed crematory and ashes are buried by the crematory at a pet cemetery. I was born and raised in Arizona and even though it's a lot of desert, I fell in love with all the wildlife and domestic animals that I encountered. I was fascinated by them and their way of life at an early age. I remember my parents taking me on trips to zoos, aquariums, farms, and national parks. I was always looking for the animals; wanting to learn more. It was at this young age I knew I wanted to be a veterinarian. My interest in animals has taken me across the country. I graduated with my Bachelor's from the University of Arizona (GO CATS!) and headed to Orlando, Florida to work as a Marine Mammal Intern at The Seas, EPCOT at Walt Disney World. I had my sights set on becoming a marine mammal veterinarian at the time. After this, I worked as a veterinary technician, took graduate courses in conservation biology, and worked my way into veterinary school. I graduated a University of Florida gator in 2011 with my Aquatic Animal Health certificate and went into small animal practice. I stayed in Florida for 2 years practicing small animal medicine where I got to be part of our house call service of which were mostly in-home euthanasias. Having to personally struggle with leaving my own cat of 17 years at my vet's clinic after saying goodbye, I felt obligated to take these house calls and provide this service in the home where the whole family is comfortable. I moved to New Jersey to be closer to my husband's family in 2013. While starting Lap of Love in New Jersey, I worked in general practice in Woodbridge township for 2.5 years and in 2016 I left to pursue end-of-life care full time. I am excited and grateful to be able to provide the Lap of Love service here in New Jersey. "Thank you Dr. Shannon for helping us send our beautiful girl into peaceful sleep. You showed generous compassion and support and my husband and I are forever grateful. 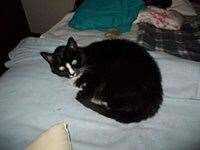 Precious was with us for 12 years before losing her battle with cancer in the end. She was the light in our life and was loved by all her family and her sister Minnie. My husband and I take comfort in knowing she is sleeping peacefully now and no longer suffering. Thank you Lap of Love for being there for us during our time of need. 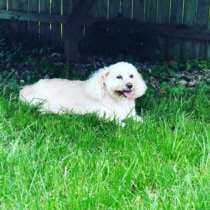 Rest in Peace Precious Wilson 2/8/2007 - 4/1/2019"
"I am so very grateful for the loving care Dr. Shannon provided for Bradley. One couldn't ask for a more compassionate, loving and professional person to help him in his final moments. I am so thankful to her and Lap of Love for being able to allow my darling boy the ability to say goodbye in the comfort of his own home, surrounded by those who loved him. Many, many thanks!" "Dr. Shannon is one of the most compassionate and considerate people I have ever met. She held me as I sobbed - and let me take my time in saying goodbye to my best friend. Letting go of the ones you love is always a painful process. I am thankful that Dr. Shannon helped me through it. My Bisk was all heart and soul (with a little bit of devil) and I miss her sorely. 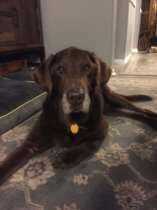 She had a wonderful 17 years and I know she's with her brother, creating havoc at Rainbow Bridge." "Making the decision to put Princess to sleep was extremely hard. The first time I called and cancel (24 hours notice). I was very scare , sad and didn’t know if I was making the right decision. When I called again to reschedule they were extremely nice and understandable. On Friday when it was time Dr. Shannon went over everything with me. Dr Shannon was so supportive and I felt like I wasn’t alone, she was my angel that day. I wouldn’t have asked for another better vet. Thank you so much Dr. Shannon." "Dr. Shannon went above and beyond to help me as I had some doubts as to whether it was Dazzles time. I knew I was making the correct decision after speaking with her. Dr. Shannon was compassionate and gentle with my old girl. I would highly recommend her." Extended Travel areas (Additional $50-100 may apply): Burlington County, Essex County, Hudson County, Hunterdon County, Monmouth County, Morris County, Ocean County, Union County, parts of Mercer County.